Do you have experience with this type/style/size of wedding? What is your work style? Are you comfortable directing and making suggestions? Do you prefer detailed guidance? Do you have a look book that includes bouquets in my color palette? How many other weddings will you be working on around my wedding date? 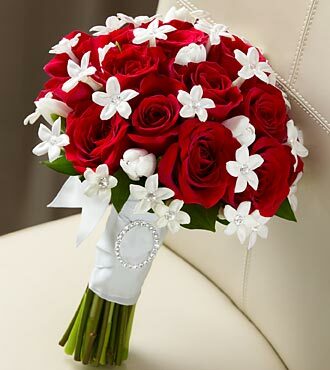 Can the person who will create the arrangements put together a sample bouquet for me? Based on my wedding, what set of floral arrangements would I need? Which flowers would you recommend based on the time of year/season and color palette? Which flowers can be substituted to better fit my budget? Which items can be rented (to help minimize costs)? What color lighting would you recommend based on flowers and color scheme? When will the order need to be finalized? What is the required deposit? Also, some florists offer a complimentary toss bouquet or bride bouquet – be sure to ask! A lot of other questions will come to mind as you meet with various florists. Ask everything you need to make sure that you come away with a clear understanding of what that florist can do to make your special day even more special. Once you’ve selected your florist, you will want to schedule a trial run about two to three months prior to the wedding and will then want to finalize your flower choices about six weeks prior, before the florist places the final floral order. Congratulations, bride-to-be!